This is a guest post by Rémy Nsengiyumva, Health Technical Advisor of FVS-AMADE. Did you know that 58% of children under age five in Burundi suffer from chronic malnutrition? When UNICEF reported this statistic, the NGO that I work for, FVS-AMADE, decided to take action. You see, our mission is to support orphans and vulnerable children in Burundi by involving communities in their care. We have done this over the past 14 years by forming Children's Protection Committees, under which a staggering 45,000 orphans are cared for. Since we want to ensure that the children receive holistic care, nutrition became a priority for us. 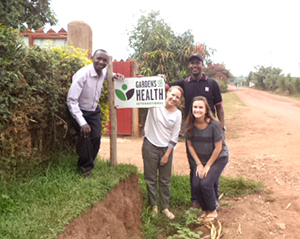 Thanks to a mutual donor, Segal Family Foundation, we were introduced to and encouraged to visit Gardens for Health International, a Rwanda-based organization specializing in providing solutions to childhood malnutrition. So at the end of January, my colleague Edouard Niyungeko and I traveled to Gardens for Health for a study tour, with the hopes that sharing our knowledge and experiences would mutually enrich our organizations. Located a few kilometers from Kigali, we found a house used as an office, surrounded by beautiful gardens of different plants, all useful in the fight against malnutrition. Welcomed by team members Connor and Daniel, we learned about Gardens for Health's approach: they partner with health centers to integrate agricultural support and comprehensive health education into the clinical treatment of malnutrition. What began as a pilot project with a dozen families at two health centers has grown into a program that will reach 2,160 families at 18 health centers this year alone. 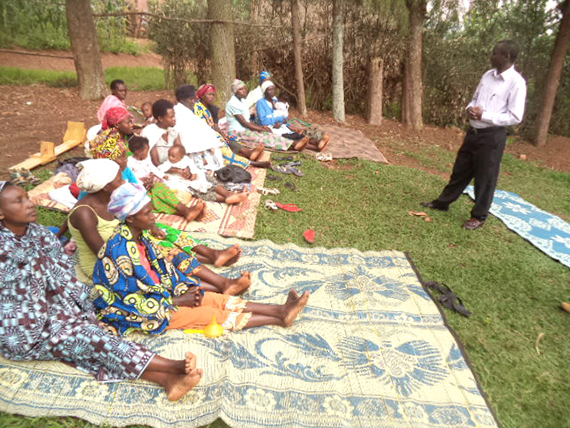 Daniel took us to a neighborhood known as Mukuyu Cell, Rubungo Sector, where approximately 25 women were attending a Gardens for Health class. This class was part of a series involving 14 training sessions on nutrition and nine sessions on agriculture. In the two hours we spent there, the two field educators taught us a great deal about nutrition. 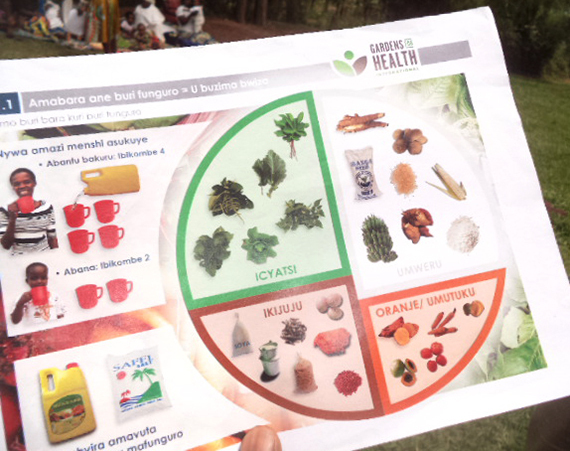 Gardens for Health uses a system of four colors--green, white, brown and orange--to represent a nutritional composition. This allows illiterate people to memorize the composition of a balanced meal. We learned how to cook a well-balanced meal in one hour. Watching the facilitators interact with community members was also helpful to us. 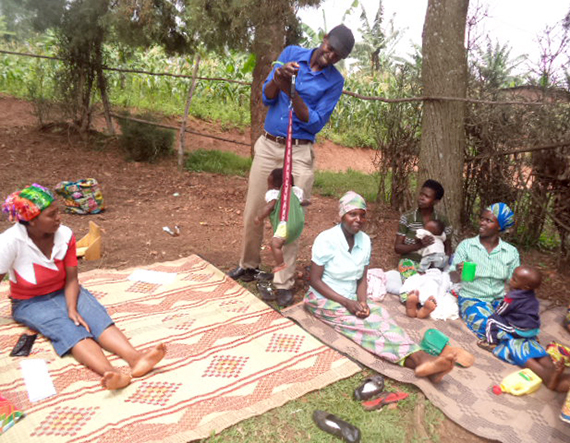 When mothers attend the training sessions, Gardens for Health staff take measurements of their children. In this way, the children enrolled in the nutritional rehabilitation program are monitored over a period of 12 months to assess their progress. Back at the Gardens for Health farm, we shared a delicious (and colorful!) meal with other staff members. 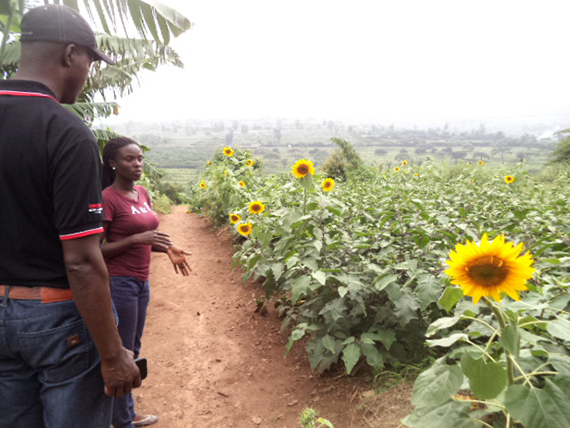 Then Nicole, a veterinarian, took us on a guided tour that included a demonstration of different field models with plants of multiple uses: plants for edible food, plants for animal feeding, plants for fertilizing the soil. We were shown the small farms of rabbits, pigs, and goats that serve as breeding models for the surrounding population. Gardens for Health provides seeds and small livestock to families as part of their "home garden package" for every family. Meeting with so many staff members gave Edouard and me great ideas for what we could implement at FVS-AMADE. We talked all the way home about how we could fundraise for 15 staff members to attend trainings in Rwanda, in the hopes that a few Children's Protection Committees could pilot these new ways to think about agriculture and adapt the nutritional cooking into their communities. I have already started practicing the technique of one pot, one hour. It's saving money that was used to buy charcoal for cooking, and preparing a dish in four colors helps me to be vigilant about the balance of the daily meal. I have no doubt that putting this knowledge into practice will reduce child malnutrition in Burundi.